This name uses Spanish naming customs: the first or paternal family name is Chacín and the second or maternal family name is Molina. Jhoulys Jose Chacín Molina (Jo-LEASE Cha-SEEN; born January 7, 1988) is a Venezuelan professional baseball pitcher for the Milwaukee Brewers of Major League Baseball (MLB). He previously played for the Colorado Rockies, Arizona Diamondbacks, Atlanta Braves, Los Angeles Angels, and San Diego Padres. In 2013, Chacín rebounded to give the Rockies a much needed lift in the rotation. He finished 14–10 with 3.47 ERA in 197.1 innings pitched. He kept the ball in the ballpark, allowing 11 home runs, 6 of which were allowed in Coors Field. Chacín began the 2014 season on the DL with shoulder inflammation. Chacín's 2014 was not good at all, as he battled through injury and inconsistency, managing to start just 11 games before being shut down for the season due to injury. His record finished at 1–7 and a career worst 5.40 ERA. On March 22, 2015, Chacín was released by the Rockies. On April 14, 2015, Chacín was signed to a minor league deal by the Cleveland Indians. He was granted his release on June 18 after exercising an opt-out clause. He had a 3.21 ERA in 7 starts for the Triple-A Columbus Clippers. On June 20, 2015, Chacín signed a minor league contract with the Arizona Diamondbacks. Towards season's end, Chacin started 4 games for the D'Backs. On December 14, 2015, Chacín signed a minor league contract with the Atlanta Braves. He was also given a non-roster invitation to MLB Spring training. Chacín began the 2016 season with the Gwinnett Braves of the Class AAA International League, and was promoted to the major leagues on April 12. He started 5 games for the Braves, going 1–2 with a 5.40 ERA. On May 11, 2016, the Braves traded Chacín to the Los Angeles Angels for minor league pitcher Adam McCreery. Chacín began his tenure with the Angels in the rotation but was then pushed to the bullpen. He served as a swingman for the Angels, appearing in 29 games total, 17 of them starts. He finished 5–6 with 1 complete game and an ERA of 4.68 for the Angels. On December 20, 2016, Chacín signed a one-year contract with the San Diego Padres. At the end of spring training, he was tabbed to be the Padres opening day starter. Chacín finished the year 13–10 with a 3.89 ERA and 1.27 WHIP in ​180 1⁄3 innings and 153 strikeouts. He established career highs in games started, strikeouts and strikeout per nine innings (7.64). He shared the major league lead in hit batsmen, with 14. On December 21, 2017, Chacín signed a two-year, $15.5 million contract with the Milwaukee Brewers. On June 2, 2018, Chacín earned his fourth win of the season with the Brewers while pitching 5 and two-thirds innings against the Chicago White Sox. On March 28, 2019, Chacín got the start for opening day against the St. Louis Cardinals, and got the win. He also hit his first major league home run against Miles Mikolas during the game. On December 1, 2010, Chacin's girlfriend Alba Iratorza gave birth to his daughter, Nicole. ^ Miller, Doug (March 23, 2009). "Rox send three top prospects to Minors Club pares roster as Koshansky, Reynolds, Chacin latest to be cut". MLB.com. Archived from the original on March 27, 2009. Retrieved April 8, 2009. ^ Ringolsby, Tracy (February 3, 2009). "Rockies top prospects, No. 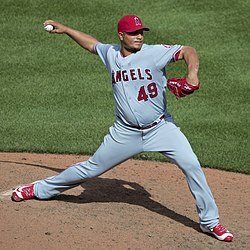 2: Jhoulys Chacin, pitcher". Rocky Mountain News. Retrieved April 8, 2009. ^ "Jhoulys Chacín Stats, Fantasy & News". MLB.com. Retrieved January 15, 2019. ^ "Jhoulys Chacin diagnosed with pectoral injury after getting second opinion – HardballTalk". nbcsports.com. Retrieved December 4, 2014. ^ "Jhoulys Chacin hopeful to miss just 2–3 weeks for Rockies". FanSided. Retrieved December 4, 2014. ^ Harding, Thomas (March 22, 2015). "Rockies unexpectedly part ways with Chacin". MLB.com. Retrieved March 22, 2015. ^ Fox Sports Ohio (April 14, 2015). "Indians sign RHP Jhoulys Chacin". foxsports.com. Retrieved April 14, 2015. ^ Hurcomb, Michael (June 18, 2015). "Indians release Jhoulys Chacin from minor-league deal". fantasynews.cbssports.com. Retrieved June 20, 2015. ^ Short, D.J. (June 20, 2015). "Diamondbacks sign Jhoulys Chacin to minor league contract". hardballtalk.nbcsports.com. Retrieved June 20, 2015. ^ by RotoWire Staff (December 15, 2015). "Braves' Jhoulys Chacin: Joins Braves on minor league deal". CBSSports.com. Retrieved March 22, 2018. ^ "Jhoulys Chacin pitches a gem in G-Braves opener | G-Braves". gwinnettdailypost.com. April 7, 2016. Retrieved March 22, 2018. ^ "Braves bring up RHP Jhoulys Chacin to start at Nationals". Espn.go.com. April 12, 2016. Retrieved March 22, 2018. ^ Bowman, Mark (May 11, 2016). "Braves trade Chacin to Angels for lefty prospect". MLB.com. Retrieved May 11, 2016. ^ "Padres sign RHP Jhoulys Chacin and LHP Clayton Richard to one-year contracts for 2017 season". MLB.com. December 20, 2016. Retrieved December 20, 2016. ^ McCalvy, Adam (December 21, 2017). "Brewers bolster rotation with Chacin, Gallardo". MLB.com. Retrieved December 21, 2017. ^ "Sample Player Profile Page". Baseball.playerprofiles.com. Retrieved March 22, 2018. Wikimedia Commons has media related to Jhoulys Chacín. This page was last edited on 15 April 2019, at 02:31 (UTC).